Hud-1 Settlement Statement is used to account for all funds from both buyer and seller in a real estate closing. We as a community need to understand that subprime has noting to do with the borrower, except they make payments. It is all about the investor. He, who has the GOLD, writes the RULES. Investors know if you have the propensity to always pay your mortgage on time, you will continue do to do such! You might be late or behind on something else, but you’ll handle the house note or you have no roof to live under. Consider owner occupied rates are lower than non-owner occupied rates, down payment requirements and underwriting guidelines are more favorable toward owner occupied properties than on investment properties. Finance 101! There was a lot of loose money in investor’s wallets as we moved into the 21st century and investors are always looking for rates of return that exceeds current market rates. These investors invest in loan pools as historically they tend to be safe investments, and all of the professional real estate guru’s were predicting continually increasing appreciation in real estate prices. On the other hand you have Congress had changed the deductibility of interest charges, except mortgage interest. This was a keg of dynamite with Americans trying to live the American by using their home’s equity as a credit card. Quiet as it is kept, you also had the credit repositories manipulating and adjusting their credit models in creditor friendly ways. I can’t give you an estimate on the number of loans originated where the credit scores were based on an antiquated FICO model. Back in 1999 I was fighting tooth and nail with wholesale lenders as to their credit scores differed significantly from reports I pulled from my credit vendor. I quickly learned lenders preferred using older credit models and they resulted in lower credit scores, therefore they justified higher interest rates and consequently they were able to generate higher loan fees and higher premiums yields when the loan pools were sold in the secondary market. I shortly (2 months) worked for a company when I first started in the mortgage business (a large national firm), which had developed a software application that would essentially take any loan and compute the loan fees applicable to a Section 32 loan. Then it would adjust the fees downward to display on the estimated HUD1 such that they were slightly below the Section 32 triggers. Clearly, predatory lending at its finest! We were selling high rate loans with exorbitant fees to desperate borrowers who had experienced life issues that required an influx of cash with severely damaged credit. There is a lot of history that MUST be understood before one can just spew words or wisdom as to how we reached the current state of affairs. It started with the deregulation of financial institutions under the Regan Administration and the weak oversight provided to the activities of these lending institutions. Can we say Savings & Loan crisis? Then to light the match, you had a bunch of individuals to come into the mortgage finance business with neither training nor experience, with their only goal being to make a quick buck! Pair that combination with homeowners who were gullible for what sounded good and what provided a momentary relief from their financial pains. You get sick and tired of collectors calling you daily to make delinquent payments when your money is funny and your change is strange. No COST, No FEES! Complete joke, the costs and fees are bundled into the loan and rate such that the lender take care of the charge on behalf of the borrower in exchange for accepting a much higher interest rate. Look at your HUD1 and look for entries that indicate Paid outside of closing or (POC). Consumers must understand and realize there are no FREE lunches and if it sounds too good, it probable is. Raise your hands! How many loan officers have originated loans that the exclusive benefits were for the lender and not the borrower? Yeah, the borrower got K cash-out of the loan but it cost him/her k in equity to do the deal. Sounds quite expensive to me! Borrower’s beware, read and understand the fine print! Don’t take the word of a commission grabbing loan officer, but seek to identify responsible trusted professionals who have your best interest as they advise you. Also remember, your home is not your personal credit card to be used to buy toys or go on extravagant vacations! That’s marketing that make those claims and not Money 101. Marketing will keep you broke, with bad credit and a borrower instead of a lender; Money 101 will make you the lender one day and not a borrower for life. Many prospective homeowners have been shocked and surprised when they arrive at the closing table. To date, most homeowners have only been supplied with a good faith estimate showing their potential closing costs and fees; none of which were set in stone. The difference between good faith estimates and actual closing costs have even forced some home buyers to walk away from the home of their dreams that they were so close to owning. Closing costs aren’t really that mysterious and scary, but each lender has their own fees and costs for items like appraisals and even title fees. The mortgage industry has many different factions, but after many years HUD has put new rules in place to curb the last-minute surprises at closing. These rules went into effect January 1, 2010 and are designed to not only prevent unplanned closing costs for the home buyer, but to save them money as well. The good faith estimate will see the most significant changes and for good reason. For many home buyers, especially first time buyers, this document is their only guideline for the costs they are about to incur with buying a home. A Good Faith Estimate is given to borrowers, from their lender, when they apply for a mortgage. Most good faith estimates will change several times during the buying process and should definitely change when the property a buyer is interested in changes. The new and improved good faith estimate now requires the lender to disclose features that may drive up the costs. Information about increases in interest rates before closing is a major factor. This is most helpful for borrowers that are applying for an adjustable rate mortgage. If the loan includes a balloon payment or early payoff penalty, that must be stated as well. The good faith estimate now has to be on a uniform three-page document when given to the prospective borrowers and home buyers should have a copy of their Good Faith Estimate within 72 hours (business hours that is) of applying for a mortgage. This document allows the borrower to figure out the total cost, closing costs and monthly payments before sitting down to sign the final paperwork on a home. The new good faith estimates will allow homebuyers to compare loan offers from different financial institutions as well. Shopping for the best deal could mean the difference between waiting and buying for many first timers. Since the new rules also require that lenders give mortgage applicants a copy of their settlement cost, the HUD-1, no less than one day before closing, homebuyers can walk up to the closing table confident about their financial decision. Lenders must make sure that the settlement figures match the good faith estimate line by line, allowing the borrowers to see any changes in costs. While cost from 3rd party sources such as title insurance and appraisals are allowed to increase up to 10% from what is on the good faith estimate and the actual fees at closing, lenders are no longer allowed to increase any fees charged by them. Whether buying a home on the traditional market or purchasing a foreclosure or REO property, in the end, the settlement process of a mortgage, the closing, shouldn’t ruin the joy for prospective homeowners. These new rules by HUD will eliminate the confusion many have experienced in the past and home buyers will be more educated before the big day. Trent Realty, Florida REO and Florida Real Estate professionals, provide up to date information and changes in the world of real estate. Visit the Trent Realty Blog to stay informed and let Trent Realty help you find that perfect Florida home for sale. Oh, human errors. They’re so natural—and so unfortunately inevitable. If you don’t think it can happen to you, think again. It doesn’t matter how careful you are, or how many times you go over your data, your numbers, and your deals. But the human eye can’t catch everything—and everyone makes mistakes. Sometimes, the error isn’t yours: it’s the mortgage company’s, or the title company’s. So let us count a few wrongs! Common Scenario #1 . Let’s say you are creating a new HUD closing statement . Your modus operandi is to take an old HUD settlement statement , and pop your new numbers into the various fields. But have you ever done something like this, and found the old numbers hanging around? Perhaps they’re in fields that you thought you changed, but didn’t. Perhaps they’re in fields that were inapplicable to the new deal—but haven’t been deleted. Needless to say, this kind of approach is ripe for error—and can ripple throughout a deal. Easy Solution 1 : Easy Soft’s Easy HUD Software captures all case information at the outset—using a fresh set of HUD forms and other documents. You never have to worry about the embarrassment—and inaccuracy—of stale info again. Common Scenario #2. You’re representing the buyer for the sale of a home. Your client remits 0,000 to pay off the seller’s mortgage. Three years later, the buyer is now the seller. The title company found that the lender never recorded a mortgage release for that 0,000—and technically, the lender still has a lien. Easy Solution 2 : If you have Easy Soft’s Easy HUD Software , you’ve got the information for the fix right in your current software. There’s no need to send a paralegal to a cold dark storage facility, or spend a late night going through one dinosaur hard drive after another. Common Scenario #3. The lender overcharged his mortgagee by something small and undetectable: say . This mistake is discovered at the closing. With the new RESPA rules, you can’t just write a check for to fix it—you’ve got to file an amended HUD settlement statement. Easy Solution 3 : If you have Easy Soft’s Easy HUD Software , you can generate a new HUD closing statement faster than you can say “fifty bucks.” You shred the old and voila! Problem solved. About Easy Soft: Easy Soft has been a law office software leader since 1986. The company offers specialized solutions for real estate, family law, time, billing & trust account management and document automation. More than 15,000 customers nationwide use Easy Soft products to increase office productivity. In this article I am going to draw on my experience as mortgage banker to outline some of the most common ways that you can guarantee a smooth closing on your next mortgage. I am going to define “smooth” as being a more or less stress free transaction that closes on or before that contractual date as stated on your purchase contract. If you think of you new loan as a production process that is to say material is required to produce an end product with the end product being your loan, then you need to understand the bottlenecks that can slow the production process down. In what follows, I am going to explore what I consider to be the two most important relationships that if managed correctly, will ensure the best closing experience. The first and likely most important part of the loan production process is the relationship between you, the mortgage bank and the flow documentation to and from. If this is the first time that you have ever purchased a new home the list of documentation that the bank requires will seem daunting. Mostly because these are items that you probably don’t keep in one place or may not have readily available. They may be items that you have even lost or misplaced such as a social security card. Or you may shred your recent bank and or your quarterly 401(k) statements. The single best thing you can do for yourself when you receive the list of required documentation is to immediately start working on it. If there are items that you do not have, put a lot of effort into determining how you can get them. Also, read very carefully what the bank is asking for. A common mistake will be to send in the first page of your bank statement when you’re being asked for all the pages (even the pages that may be blank). The last recommendation that I will make on document flow is to make sure that you send in the documentation together as one package and not piecemeal. Following this strategy will greatly enhance the speed of the loan underwriting process and hence the loan closing. The second relationship that I want to focus on is that which lies between the mortgage bank and the title company where the actual loan will be closed. If the bank does not have a strong relationship with the chosen title company I can assure you that this can result in having a very bad day. In general, the title company has the fiduciary responsibility to ensure that your transaction is insurable. Furthermore, the title company has the responsibility of generating your HUD1. The HUD1 is basically the final document that outlines in dollars and cents how much money is going where and to whom. To put it lightly, there is a mountain of communication that goes back and forth between the bank and the title company. To further the stress the process, all of the communication typically happens right before you are expected to close and this is true with all mortgage transactions. In order to make sure that your lender has a relationship with the title company it is actually best to ask your lender what title company they recommend and then before you sign the purchase contract make it understood to your agent and the sellers agent that this is the title company that you need to close at. There are some instances where a builder (new construction) will require you to close at their chosen title company in order to get the credit they are offering but in most cases if you ask, you should be ok. Here at Easy Soft, we figure: why reinvent the wheel? That’s why all of our software is geared toward capturing your client’s case data at the outset, and integrating it into all of the ensuing legal forms, correspondence, and financial statements including—most crucially for real estate deals—your HUD forms. Once the data’s been captured, Easy Soft’s Easy HUD Software performs automatic calculations—resulting in pitch-perfect HUD closing statement (and other forms and statements) every time. ‘Wouldn’t all software increase my accuracy, though?’ you wonder. Getting a machine to do something better—in less time—is always the goal of technology, right? This is partly right—but it’s also partly wrong. It’s true that all real estate closing software seeks to automate some portion of a real estate closing. But some HUD software packages may segregate legal forms from financial statements, requiring you to entirely re-enter some of the case data. Not with Easy Soft. Our HUD software is fully integrated. What this means? It’s a low-touch system: the minimization of entries minimizes human error. You need only enter any piece of data one time—not multiple times, in multiple programs. You need only make sure that one entry is accurate, and after that, you can wash your hands of it: you’ve done your job. 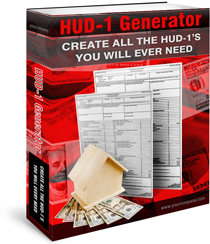 Our HUD-1 software will use that data in all calculations, forms, and statements that call upon it—including the monstrously complex, comprehensive HUD settlement statement (also known as a HUD closing statement, or HUD-1 ). We at Easy Soft feel like making your practice more accurate isn’t too much to ask of technology. Just call us, get a real person on the line, and find out how genuinely excited we are to help! Question by csewell44: Certified Copy of the final HUD-1 Settlement Statement v.s. Signed Copy of HUD-1, For 8K tax credit.? Send COPIES of the HUD-1 that is signed by the title agency and you. Write a statement to the IRS indicating that your title agency WILL NOT give you a copy of the HUD-1 signed by the seller due to ‘privacy laws’. If they do not approve of the copies you send, they will disallow the credit; you should IMMEDIATELY APPEAL that decision and you will be scheduled to see an agent. Bring the documents that you DO HAVE to the agent and he/she usually signs off on the credit.